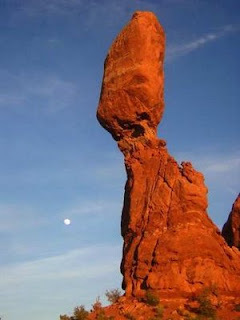 This is a picture of Balanced Rock in Arches National Park. We came here on day two of our field studies trip and we stopped at the view point for balanced rock. It is great picture of differential weathering. Differential weathering is the process where the harder rock is worn away less rapidly than the softer rock. With Balanced rock the big bolder that that is balanced is part of the Slick Rock layer (sandstone) and the pillar that is balancing it of the Dewey Bridge layer (shale. )The Shale erodes away faster than sandstone because of its composition of clay is easily eroded away by water. The sandstone is more resistant because of the quartz in it. That is the reason why the Dewey Bridge Shale is eroding away faster than that of the Slick rock sandstone. With Balanced Rock in this picture the Dewey Bridge is weathering faster and it breaks apart and crumbles leaving the Slick rock standing on a smaller than its self pillar. Slowly the Dewey Bridge will weather away completely and the Slick Rock bolder will fall because of gravity. Isn't amazing how weathering forces create such beautiful features?